The Federal Communications Commission on Thursday formally referred Sinclair Broadcast Group's proposed acquisition of Tribune Media to an administrative judge hearing, and called into question whether some of its divestments in the deal were a "sham." Sinclair has been waiting on FCC approval to complete its $3.9 billion purchase of Tribune, further increasing Sinclair's reach across the country. 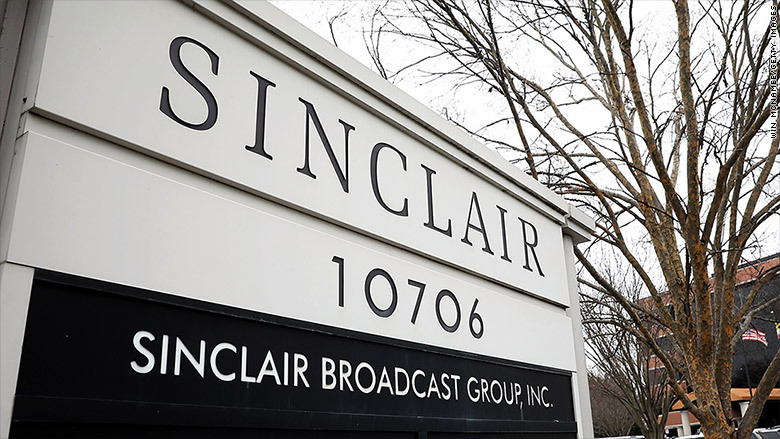 Citing the sale of three stations Sinclair had planned in order to fall within government ownership caps, the FCC in its hearing order said, "The record raises significant questions as to whether those proposed divestitures were in fact 'sham' transactions." Two of the stations in question were set to be sold to Cunningham Broadcasting, a company run by the estate of Sinclair chief executive's mother, at below market value prices, the FCC writes. "The close relationship between Sinclair and Cunningham could explain how Cunningham was able to able to execute an agreement to purchase stations KDAF and KIAH at what appear to be below-market prices," the commission wrote in the hearing designation order. Another possible sale "proposed to transfer WGN-TV in Chicago to an individual (Steven Fader) with no prior experience in broadcasting who currently serves as CEO of a company in which Sinclair's executive chairman has a controlling interest," the commission wrote. The hearing order also says "substantial and material questions of fact exist" regarding whether Sinclair "engaged in misrepresentation and/or lack of candor in its applications with the Commission." Now the transaction will go through a hearing, which could be a lengthy process and could mean the end of the deal. Tribune Media said it is now assessing its options. "Tribune Media has now had the opportunity to review the FCC's troubling Hearing Designation Order. We are currently evaluating its implications and assessing all of our options in light of today's developments," the company said in a statement. "We will be greatly disappointed if the transaction cannot be completed, but will rededicate our efforts to running our businesses and optimizing assets." A Sinclair spokesperson did not immediately respond to a request for comment but said on Wednesday that they have always been "completely transparent" with the FCC regarding the station sales, including "any ongoing relationship we would have with such stations after the sales." "All relevant agreements documenting such terms as required by FCC rules have been filed. While we understand that certain parties, which oppose the transaction object to certain of the buyers based on such buyers' relationships with Sinclair, at no time have we withheld information or misled the FCC in any manner whatsoever with respect to the relationships or the structure of those relationships proposed as part of the Tribune acquisition," Sinclair spokesperson Ronn Torossian said on Wednesday. "Any suggestion to the contrary is unfounded and without factual basis."